14 June 2018 // This week, IF has been present at the 11th session of the Conference of the States Parties (COSP) to the Committee on the Rights of Persons with Disabilities (CRPD) “Leaving no one behind through the full implementation of the CRPD”. IF was represented by IF Deputy Secretary General, Ewa Kampelmann, and IF Secretary General, Lieven Bauwens. 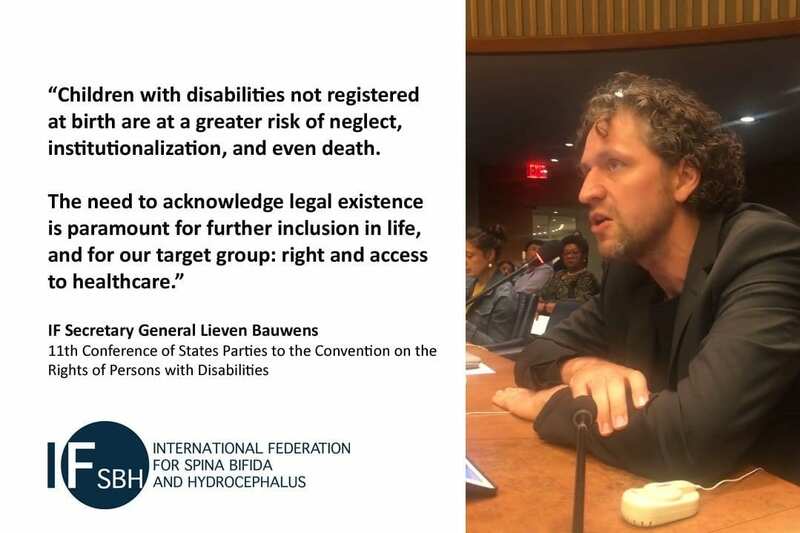 Lieven Bauwens made a statement during the Plenary Session of the COSP. He emphasized the importance of children with spina bifida and hydrocephalus being registered immediately after birth and their right to access to health care. Birth registration is a fundamental right that ensures all children’s recognition before the law. It’s crucial that we do not tolerate any violation on these rights. IF’s call upon member states is based on the implementation of the Sustainable Development Goals (SDGs) as well as the CRPD. It is in line with the Agenda 2030’s objectives such as reducing inequality and achieving a full inclusion of people with disabilities in our society. Please watch the full statement here, and find more information on the Conference here. It is an honour to address the 11th Conference of State Parties on the CRPD on behalf of the International Federation for Spina Bifida and Hydrocephalus, also known as IF. IF is the global umbrella of over 60 spina bifida and hydrocephalus associations spread over 5 continents and represents many thousands of people living with spina bifida and hydrocephalus and their families. Spina bifida is a congenital disability, children are born with it. Hydrocephalus is a brain condition with a variety of causes, the majority acquired after an untreated neonatal infection. Most children born with spina bifida might also develop hydrocephalus. With proper treatment and support, children with these disabilities can thrive and live their lives equal to others. The births of around one fourth of children under the age of five worldwide are never recorded. Children born with disabilities are not registered in larger proportions than their non-disabled peers. This is a violation of CRPD Article 18 paragraph 2, which states that children with disabilities shall be registered immediately after birth and have the right to a name, nationality, and being cared for by their parents. Birth registration is a fundamental right, recognized by article 24, paragraph 2 of the International Covenant on Civil and Political Rights and article 7 of the Convention on the Rights of the Child. The Sustainable Development Goals call to provide legal identity for all, including birth registration, in target 16.9. We would like to remind delegates that in its general comment No. 9, the Committee on the Rights of the Child noted that children with disabilities not registered at birth are at a greater risk of neglect, institutionalization, and even death. The need to acknowledge legal existence is paramount for further inclusion in life, and for our target group: right and access to healthcare. We experience this in our work day in, day out. We sometimes see images in the news of children who have not received treatment for hydrocephalus. Their enormous heads can cause people to feel shocked and outraged, but only for a moment, and then these children are forgotten again. Who remembers Baby Roona? If she would have received neurosurgery at the right time, she would not have made headlines. Instead, she passed away last year as she didn’t receive the treatment she was entitled to, when she needed it most. And she is not alone. Every single year, thousands of children with spina bifida and hydrocephalus, and not just in developing countries, are hidden from view, do not show up in statistics, do not receive proper treatment and care, and die prematurely. Therefore, we are also looking forward to the report of the Special Rapporteur on the Rights of Persons with Disabilities on “the Right of Persons with Disabilities to the Highest Attainable Standard of Health” that will be presented to the UN General Assembly in October this year. Let us truly live up to the theme of this Conference of State Parties by “Leaving no one behind through the full implementation of the CRPD” by acknowledging the existence of newborns with disabilities. Registering children at birth is the first step in securing their recognition before the law, safeguarding their rights, and ensuring that any violation of these rights does not go unnoticed.